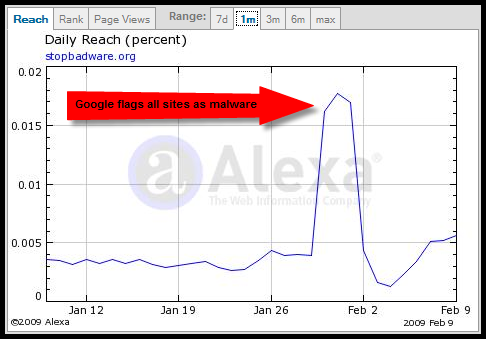 You may remember the incident that Google had on January 31, when it during 55 minutes accidentally flagged all URL:s containing “/” as a potential malware site. 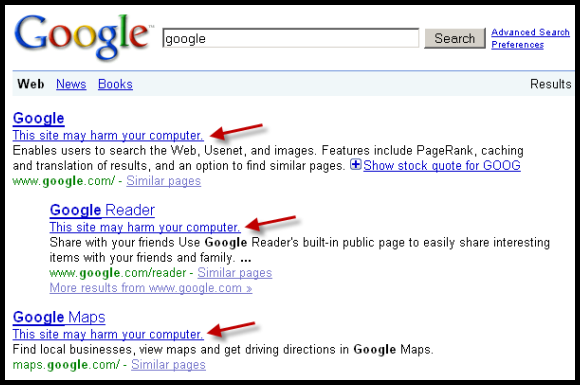 This meant that every single site on the Internet was marked as harmful, including Google.com. Everyone who actually clicked on a link was met with an information page that the site could contain malware, referring people to visit StopBadware.org for more information (Google has a collaboration with this site). This incident effectively created a DDoS attack on the StopBadware.org website as a good part of the people accessing Google Search tried visiting this page. Needless to say, the site got so much traffic that it crashed. Another interesting side effect of Google’s malware warning incident was that there were about 5 times as many searches for the term “malware” on the day of the incident, probably as people were trying to figure out what it is and why Google was warning them about it. Google is such a giant on the Internet that any changes to its homepage will affect the behavior of a huge group of Web users (augmented, perhaps, by the tendency of bloggers and journalists to cover everything Google), and this was an excellent example. Scary incident. Shows us how dangerous it is to get dependent on just one “source”. Google is far from perfect and they have gained a lot of control over not just the internet but peoples surfing behavior as well.